Lois Ericson was a forerunner in the field of home sewing education. From her Salem, Oregon studio, she was sewing, experimenting, writing, self-publishing patterns, creating, and teaching locally. Then, in the 1980’s, the formation of the American Sewing Guild (ASG) and their sponsored events, opened up outlets for many women who were quietly pursuing their sewing habits. All of a sudden, sewing went from a solitary activity to a shared, community event. People like Lois, Marcy Tilton, Roberta Carr, Sandra Betzina, Donna Salyers, Clothilde, Mary Lou Rankin, Mary Ellen Flury, now had a place to dispense their knowledge. Best of all, we had–and have–up-front, close and personal access to the creative ideas, books, patterns, of these talented, charismatic people. Have you noticed how sewers–and quilters, knitters, needleworkers, etc.–are such Fun, Interesting people? Lois’ patterns recently surfaced in a rummage through my pattern stash. By choosing ‘its a wrap!’ all sort of memories came flooding back of meeting Lois at sewing conventions, taking her classes and being excited by her creativity. I chose a cotton abstract orange and black print from Fabrix in San Francisco. It’s the perfect color for pre-Fall when trees are starting to turn from green to orange, red, and yellow yet the daytime temps are in the 70’s. The fabric was in the discount bin so decided it would be a great ‘muslin’. Turns out I love the fabric–just enough body, soft and supple, and doesn’t display a propensity to wrinkles. And, love, love, love, the pattern. Bonus–it has pockets. The Guide sheet does say this pattern is not for beginners; wholeheartedly agree. However, carefully following the instructions will take you through the most confusing–the gussets. 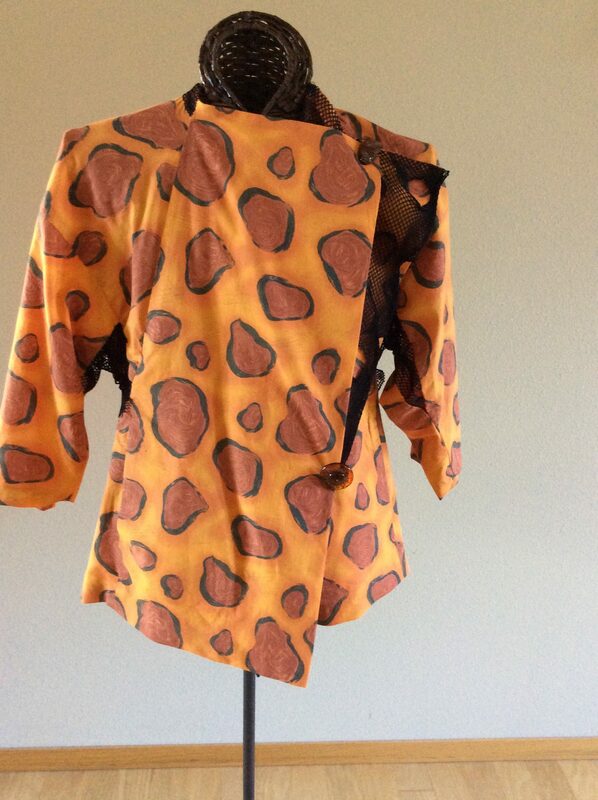 Decided the fabric needed a boost so found some Halloween mesh and added it as the gusset and the back neck band. No Placement Mark; for the button loop, but not the button. No big deal, will just try on, match center front…Wait, No CenterFront! How can that be???? Tried on, lapped right front over left, positioned as best as possible per the pattern drawing. Sewed on the button. Glad I had figured out best way to sew on a shank button. Then suggestions on how to fold and wear the overlap. This is where I was inspired to add the mesh and lap right over left exposing the front panel mesh–photos above. Creative Options are a feature of all Lois Ericson patterns. After all was sewn and done, added more mesh fused with my fave–Steam-a-Seam 2— to inside of left front and across back seam. Horror of Horrors! That front panel edge is on the straight grain, and now it’s placed off center? Here are a couple more Lois Ericson patterns in my stash and one other garment made in the late 90’s and still in my closet. Another Shopping the Closet, not only for the clothes but for the memories. The skirt merits special mention. It is one piece cut on the bias; an inspired design and a quick and dirty make. These are some of Lois’ books available on Amazon. You won’t go wrong purchasing any or all of them. The links are offered as a convenience for you to review and purchase these recommended books. FYI: As a long-time Amazon customer, heartily recommend purchasing books on Amazon. If not a Prime member with free shipping, keep a wish list and then make one purchase to meet the minimum. Amazon has the best prices and is my go-to site to compare prices. Below are affiliate links that will generate a bonus for me if you purchase by clicking on the link. The bonus to me does not increase the purchase price. In any case, thank you for shopping books by Lois Ericson. You won’t be disappointed. 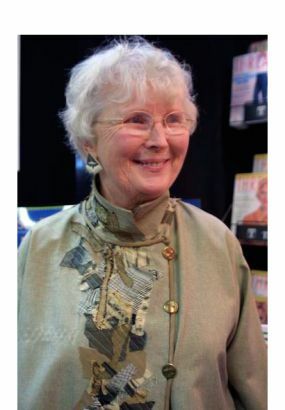 Lois contributed many articles to Threads over the years. Here are just a few examples of her great work. Thanx Lois, for granting permission to break the rules. And, Thank You for thinking outside the box to inspire us all. This entry was posted in FIBER FASHION FUN and tagged break the rules, Diane Ericson, it's a wrap!, Lines & Angles, Lois Ericson, Lois Ericson Books, Lois Ericson Patterns, shank button. Bookmark the permalink.